What is a 'Race Hate' Crime? - Gary Ling, Digital Producer, Data Monetiser, Political Savant, Information Economist, Solution Seller, Business Strategist. Listen For Balls. 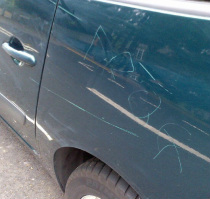 Yesterday, I bumped into a neighbour who tells me that someone had 'keyed' both his car and another on our street. I am surprised but not shocked. Sometimes the behaviour of my fellow citizens leaves much to be desired. In this case the vandal had scrawled 'Frog' on a Renault Espace and 'Nazi' on a BMW.